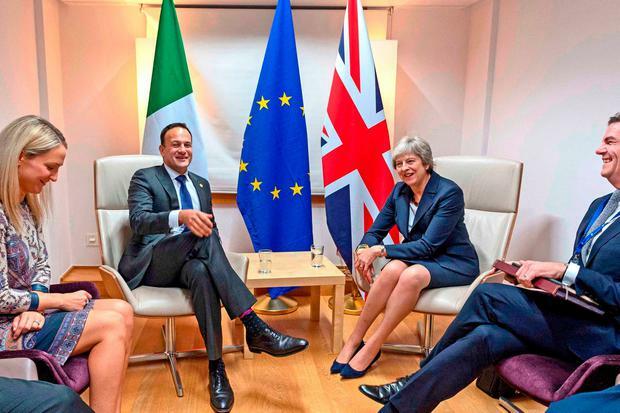 European Union negotiators have floated a tentative Brexit plan to avoid a hard border on the island of Ireland and to give Britain stronger guarantees that a customs border would not be needed along the Irish Sea. The biggest obstacle to a Brexit deal has been the necessity to keep the border of Northern Ireland with the Republic open - preserving frictionless trade and the Good Friday Agreement - while leaving the EU's single market and customs union to forge its own trade deals. The Financial Times said EU Brexit negotiators were now considering a new proposal to compromise on an Irish "backstop" - an insurance policy to ensure there will be no return of customs checks on the border between the Republic and Northern Ireland if a future trading relationship is not in place in time. Citing several diplomats familiar with the plan, the paper said Northern Ireland would remain in a deep customs union with the bloc, applying the union’s full "customs code" and following single market regulations for goods and agri-food products. Meanwhile, the UK be in a more “bare-bones” customs arrangement with the EU, in which it would apply a common external tariff on imports from outside the union and rules of origin, the FT reported, saying the plan had been presented to EU ambassadors on Wednesday and floated with UK officials. The move could raise objections in the DUP, who hold the balance of power in the House of Commons. Such a compromise plan is also likely to face opposition from Brexit supporters in May's government and party who do not want Britain to be tied into an open-ended customs union with the bloc until a UK-EU trade deal was agreed. "The same fundamental problems are there,” the FT quoted one EU diplomat briefed on the plan. "They’ve played around with the ingredients to the deal." However, sterling rose against the dollar and euro following the report, adding to earlier gains after officials said Britain and the EU had made progress on a deal to give London's dominant financial centre basic access to the bloc's markets after Brexit.